How the TRILOBULAR™ family optimizes fastener performance and lowers in-place costs. PLASTITE® TRILOBULAR™ thread rolling screws were developed specifically for use in plastics. They combine a unique TRILOBULAR™ cross-sectional form with deep, wide, spaced threads. Easier to drive. Three swaging lobes with full relief of the thread form reduce driving effort and operator fatigue. More holding power. 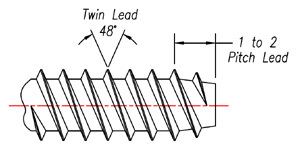 The three-lobed design of PLASTITE® screws takes full advantage of the cold flow characteristics of many plastics by allowing plastic material to recover and fill in between the lobes. This establishes maximum resistance to vibrational loosening. 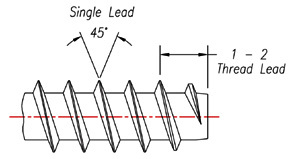 In addition, the screws' deep, coarsely-spaced threads provide a heavier shear area and deeper thread engagement in the plastic, further enhancing holding capabilities.